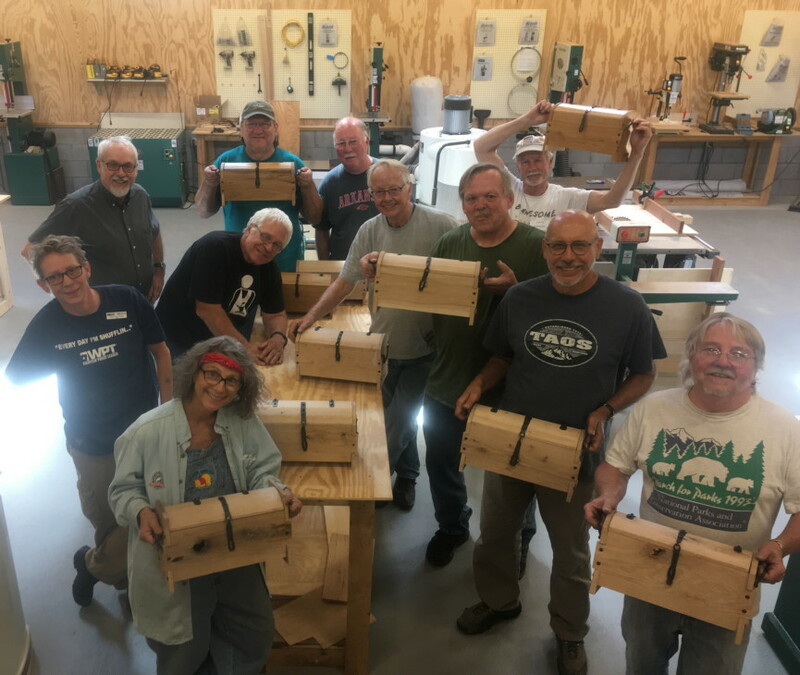 Yesterday we completed our box making class at ESSA. Today I start a parent/child box guitar class. The photo shows a collection of wooden boxes and a group of happy box makers. It was a pleasure to see the machine room and bench room at the one year old woodworking studio in full swing. I managed to go through another day of box making forgetting to take photos of student's work. We had about 15-20 folks there at ESSA for studio stroll and demonstrations, and the guests were so busy admiring my students' work that it was hard to pull them away to watch while I cut mitered finger joints as my demo. This is our last day of box making class. My students and I seem to be equally tired at this point, and I've been unable to finish some of the boxes I had intended. Today I will take in my ever popular make-it-yourself router table to show. The illustration is from Fine Woodworking. 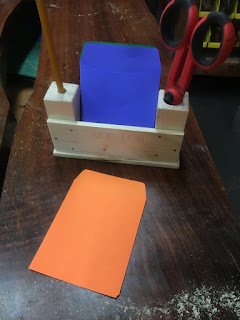 Tomorrow I begin a parent child class making box guitars. As we all know, we all learn best hands-on and through personalized instruction, and yet most schools are set up to ignore what we all know about learning. Why is that so? It's because governments and policy makers could care less. Their interest lies in management of kids and in keeping teachers cheaply in line to do so. Today we have studio stroll at ESSA and you are welcome to attend and see what my students have learned so far this week. 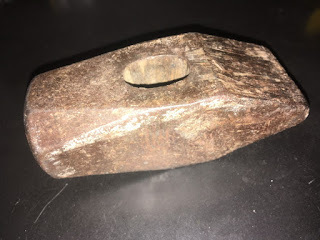 I neglected to take photos yesterday, but I received a new hammer handle in the mail yesterday for my great-grandfather's blacksmith's hammer. There is an old story about grandfathers' axes. "This is my grandfather's axe. I replaced the handle 3 times and the head twice. This is my grandfather's axe." And so I have no proof of this tool having belonged to my great-grandfather. What I do know for sure was that my dad gave it to me. I had seen it in his use. The handle had been cracked when it came into my use. I broke it myself. It is refreshed for another generation or two. Can you imagine children of a future generation? What will connect them to the fabric of humanity? I am ready for day three of Box Making at ESSA. The students are asking for demonstrations in adding hinges, using veneers and making inlay. So we will do those things. 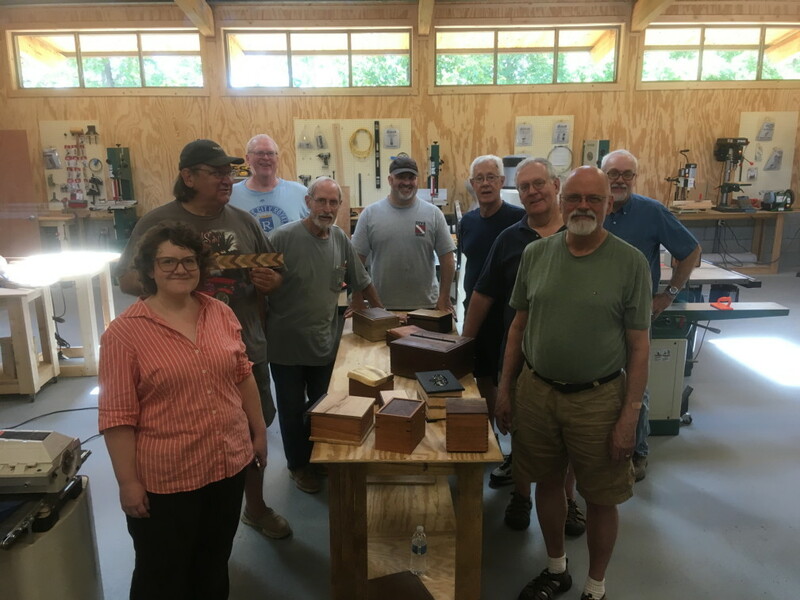 Yesterday as shown, students including my cousin Newt Heston (shown) learned to make box joints, also called "finger joints, using a dedicated router table of my own design. I wrote about it a few years back for an article in American Woodworker. It is relatively easy to use and easy to make, but still involves a learning curve. It offers several ways you can mess up and we got most of those out of our systems today. Today offers a bit more clear sailing. And some opportunity for fresh new mistakes. I made it through the first full day of class forgetting to take any photos. I will try to do better today. The students have been successfully cutting mitered joints, planing wood, resawing on the bandsaw, and figuring ways to personalize their boxes. I know it must make some curious. If the hands make you so smart, how can some folks in the trades be so foolish in how they vote against their own best interests. Examples: Live in a farm state? Vote for candidates who are philosophically opposed to farm support. Live in a poor state? Vote against those who would preserve food stamps, medicare and the affordable care act. Live in a poor state, badly polluted by industry? Vote for candidates wanting to cripple the EPA and make it easier for industries to pollute. All sad situations, but very true. I attempted to explain a a few things during the aftermath of the 2008 election, as our nation was on the brink of economic collapse. I used our old friend Joe the Plumber from the 2008 election campaign as an example. My point is not to offend, but to stimulate thought. Schools seem to operate a Harry Potter type sorting hat. These selected students will be going to college, so let's not give them the hand skills that would refresh and enliven their understanding of the real world. We'll keep those students mired in the abstract. These other students are not going to college, so let's narrow their interests to vocational pursuits. After depriving them of the confidence to penetrate the complexity of the real world, they can be managed by wedge issues to vote against their own best interests. Now Donald Trump's administration wants to combine the department of labor and the department of education. Perhaps his idea is that the only purpose of learning is to feed folks to industrial employment, and not to think higher thoughts. But the desire to figure things out through poetry, and the arts, is what makes us human. And these things are just as important as industrial employment. Normally when I teach box making, I end up getting a few boxes started as demonstrations for my students. I am taking some of these unfinished boxes to box making class today to carry a step further in the process. So while I'm helping my students make boxes I hope to use these unfinished boxes as examples and props. I will also be making a variety of jigs during the week that will be left at ESSA for future use. This week's class starting today is full with 9 students. 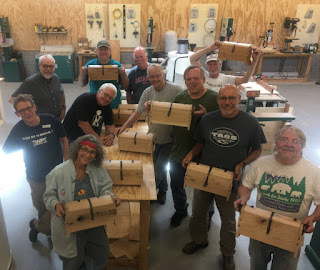 My next classes will be at the Connecticut Valley School of Woodworking in Manchester, CT https://www.schoolofwoodworking.com/ and at the Marc Adams School of Woodworking in Franklin, IN. https://www.schoolofwoodworking.com/ Check with either of those schools for details. The photo shows two large boxes awaiting further steps towards completion. Yesterday our ESSA director Kelly McDonough made a presentation at our local UU fellowship. With regard to ESSA and the arts, she made three points. One is that the arts have a profound economic impact. The arts in the US contribute more dollars to the economy than agriculture. Is that not surprising? The arts bring in a balance of trade surplus. Then there are the truly important things. The arts make us feel better, making a profound contribution to mental health. And the arts build community. Do I need to say these things? You may have discovered these three points on your own. Blacksmith Bob Patrick sent me a video on making a simple forge with four firebricks in five minutes. https://youtu.be/9cWPBKgVJy8 He notes that the hardware we made for our Viking Chests could have been made in such a simple forge. Under most circumstances, it makes sense to simplify. Other simple forges are also shown on youtube. Orbis Pictus published in 1658 is considered the first illustrated children's book and contains over a hundred illustrations showing common scenes and activities of the times. Items in the illustrations were numbered with descriptions in both Latin and the child's native language. 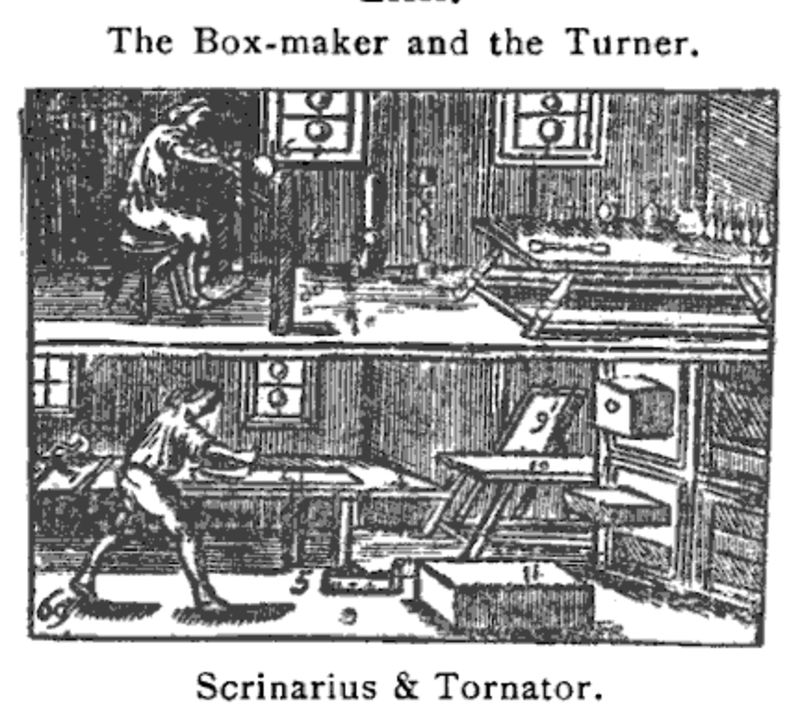 Scrinarius is Latin for carpenter, and if you can make a box, you can make nearly anything from wood. Comenius described the carpenter's work as follows: (He) smootheth hewen Boards, 2. with a Plain, 3. upon a work-board, 4. he maketh them very smooth with a little-plain, 5. he boreth them thorow with an Augre, 6. carveth them with a Knife, 7. fasteneth them together with Glew and Cramp-irons, 8. and maketh Tables, 9. Boards, 10. Chests. This week in box making our equipment will be more diverse and efficient, but the work will be to the same general effect. Make, fix, create and assist others in learning likewise. Having taken a blacksmithing class at ESSA a couple weeks ago interested me in re-handling a blacksmith's hammer that had belonged (If I have my story right) to my great-grandfather. It was given me by my dad with a split in the handle. I used it most recently as a bucking iron in making Bevins Skiffs, but having seen similar hammers in use at ESSA I decided it deserves a bit of fresh hickory to restore it to proper use. My great Grandfather had been a contractor in Ft. Dodge, Iowa and would have had use for a hammer like this. My grandfather, being an attorney did not. So, it was passed from grandfather to grandson to son. I hope to use it in the ESSA metals shop, and perhaps to make more tools like it. I went shopping for a new handle today. My local hardware store did not have one to fit. I checked Amazon and all their handles were expensive and the descriptions gave me no confidence in choosing one to fit. House Handle Company househandle.com in Cassville, Missouri (just 30 miles from here) is the place to shop online. For $3.35 plus postage, the proper handle for this hammer has been purchased and is on its way. 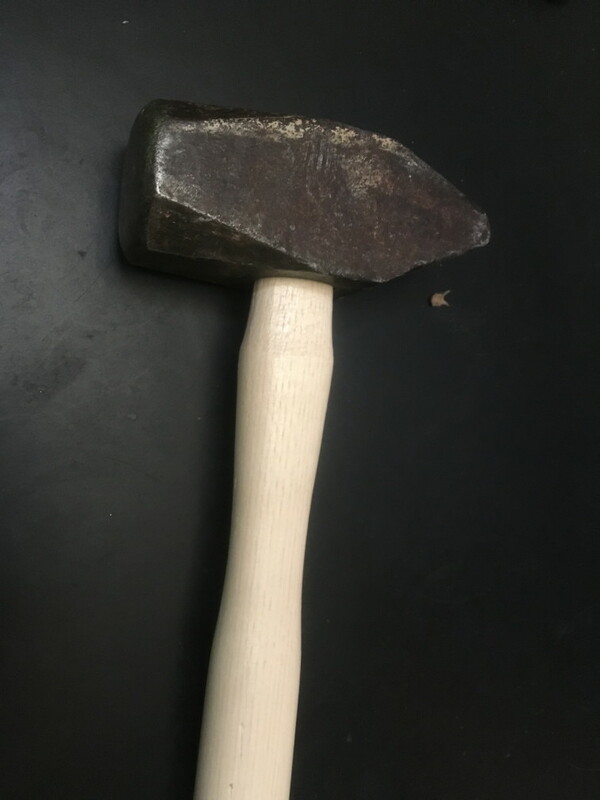 The most important thing in fitting a new handle to a hammer head is shaping the end of the handle to fit the hole in the head. A reader reminded me that liability is often given as an excuse for ending manual arts training in schools. Hand-tool wood working is far less dangerous than basketball. Power-tool wood working can also be safely done in schools. Part of the problem, however, is that administrators will load 25-30 kids in a class full of powertools and expect miracles... that all kids will be attentive and well managed. Woodworking demands greater one-on-one personalized instruction, and thus demands smaller class sizes. My weeklong box making class at ESSA starts on Monday. Raccoons, forgive me this is long. We have had armadillos digging in our gardens. While digging for grubs and worms, they uproot tiny plants and make a general cratered mess of things. So I'd set a trap. They do not respond to bait. So what you have to do is set up an obstacle course, gathering them in and directing them into the live trap. If you are lucky enough to get one to stumble in during the dark of night, you've got him trapped for relocation elsewhere in the morning. Yesterday morning I stepped out the door to be met by two raccoons staring at me. As they're creatures of the night, to see them at my door in the morning was a big surprise. I soon discovered why they were hanging out and waiting for me to arrive. There were two more raccoons in the trap I had set for armadillos. I put on a pair of gloves and carried the trap away from the house before I opened the door and watched them launch into the woods. The simple lesson is that even animals care for each other, and will linger in danger to watch over family and friends. Yesterday Melania Trump visited the border to check on children held in separation from their families. She wore a windbreaker that had a written statement on the back. It said, "I really don't care, do U?" We were told by the administration to ignore the message, and were told that it meant nothing. But she was traveling to visit children who had been taken from parents and held in detention, amidst an international furor against Trump administration policy and for whom the whole world was expressing deep concern. Let's give Melania the benefit of the doubt. Perhaps she was only making a fashion statement. “It’s a jacket. There was no hidden message,” said FLOTUS’ publicist. But the statement could be informative. There is a difference between some of us and those behind Trump administration policies. We do care. Just like a family of raccoons, we care for each other, and look out for the interests of each other. Some of us are able to extend our caring beyond family and community and find kinship with and concern for others of the human race. Others may not be equipped to do so. As I explained to one reader, I am the son of a Kindergarten teacher who saw education as a means of liberation for all persons. Kindergarten teachers were not trained to discriminate, but to love and to embrace. I am also the son of a WWII veteran who took part in the liberation of Nordhausen, a German concentration camp in which unimaginable horrors were inflicted upon those some had chosen to view as being less than human. My father had become a witness of atrocity. Forgive me if I take some of this very seriously. Aside from my parents, my hands have been instructive. As another friend pointed out, "his savior" was a carpenter and the son of one. We learn things from working with wood. 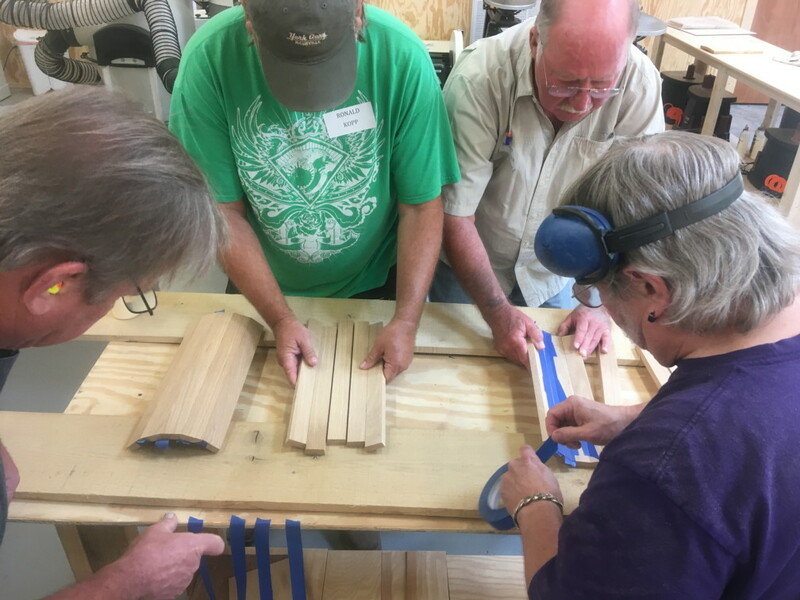 Despite our best intentions and the extreme focus of our attentions, we woodworkers make mistakes and must learn to practice forgiveness for ourselves and for others. Through craftsmanship we learn about and explore our own humanity. We strive to be better at what we do, and to offer service. In this we learn principles and practices common to all religions and to most of mankind. We strive to make the world a better place. But as my father learned in WWII, forgiveness alone, brings no justice in the face of horrors that require extreme human efforts to stop. Incidentally, this is not the first time I've caught the wrong animals in my live trap. One morning I walked out the back door and found a rabbit sitting still and looking directly at me. It hopped a few steps and turned to look back. I followed and found another rabbit in the trap. The first bunny was leading me to its mate so that I could let it go, which I did. This morning in my study of Norwegian on Duolingo, the following phrase came up: "kan dyr begå forbrytelser?" Can animals commit crimes? We know that human beings can, and that we witness serious crimes in seeing children taken from their mothers and being warehoused in camps. Some folks think that human beings are the only ones who think and care deeply about each other. They then categorize some persons as being of lesser value or lesser humanity than others. But let me assure you: the care of young mothers and fathers on the border for their children is no less than our own... In response to Melania's message (whether she intended it or not) I note, "I really do care, and it's human to do so." I continue to prepare for my classes coming up this next week. The photo shows some boxes we can make. 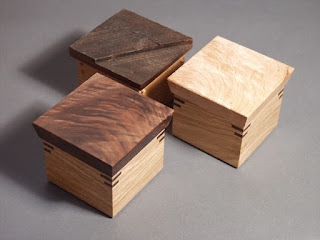 On Monday I begin a class at ESSA in box making. The class is sold out with 9 students enrolled. One week from Saturday I begin a class in parent/child making of box guitars. There are still two openings in that class. You can call ESSA, 479-253-8754 to enroll. Yesterday Trump signed an executive order ending his own policy of removing children from their parents and sending them into internment facilities. We've learned that some children have been drugged without parental permission to alleviate severe depression, anxiety and disruptive behavior likely caused by the circumstances of being removed from the protection of their parents. Trump has announced no immediate plans to reunite parents and children. At this point they may not even have the means to do so. Children have been dispersed to facilities throughout the US while their parents have been deported. Is that the kind of nation we are? And is Trump the kind of president we deserve to lead us? I am ready for one who sincerely cares about all human beings and takes steps to respect and preserve human rights. This blog has an important mission, that of directing education toward the effectiveness and efficiencies of hands on learning. But forgive me, I have been distracted. I've been calling around to Senators and representatives and our own Arkansas governor, in the hopes that they will stand up to Trump. They appear too frightened to do so. I long for the day in which each elected official sees clearly his or her role in helping us to get along with each other. In times like these, having good hand work to do is therapeutic. I've been cleaning the shop, putting away tools, gathering the needed tools for my classes and making necks for box guitars. It is important to have balance and work with the hands provides it. In fact, in the early days of manual arts training, it was known that the work with the hands would refresh and energize the efforts of the mind. Too few members of the "educated elite" will admit it. My wife and I went to Springdale, Arkansas last night to participate in a rally against the policy set by the Trump administration to remove children and infants from the care of their mothers and place them in internment camps and isolation facilities while their mothers and fathers are being deported at a wholesale pace. I find it difficult to write about my usual subject, hands-on learning, when our own nation is purposely engaged in such outrageous behavior. This is not time for business as usual. I made calls yesterday to our elected representatives. I will do the same today. Yes, I will also spend time preparing for next week's classes. Yes, I will also attend a board meeting for ESSA and a development meeting for the Clear Spring School. I will do so with a feeling that the nation we love and that we have been proud of is being stolen from us, by an egotistic thug and his evil minions. I feel a deep sense of grief. Many years ago when I worked at the Porter-Leath Children's Center in Memphis, it provided medical care to children brought in by their young mothers. I have strong memories of that time. I was interested in photography and would take photos of children and mothers that I would then put on a bulletin board for them to enjoy when they next came in. It was an opportunity for me to observe and record what so many others have done before, the deep bond between mother and child. That bond is a human bond. It is the human glue that holds us together in caring families, communities and as a nation. It is greater than any false distinctions politicians might contrive. We have leaders who have established a national policy that is tearing at that bond. That policy has set us apart from other nations, and we should feel great shame for allowing it. Join me in making calls to your local representatives. I am in the process of cleaning shop (my own) and getting ready for classes at ESSA. The photo shows the process of burning square holes in viking chests for the hardware attaching the handles. We drilled holes of a smaller size through the ends, and then used a heated rod of the correct shape to burn through. Bob Patrick made the steel rods in preparation for the class and looks on while smoke rises. The process is interesting and exciting as bursts of flame occasionally erupt. Make, fix, create. Increase the likelihood that others learn likewise. I was cleaning collected items from the center console of my truck and found a tool that should be mentioned. It is a mini machinist's set up block that can be used for both 45 degree joints and 90 degrees. 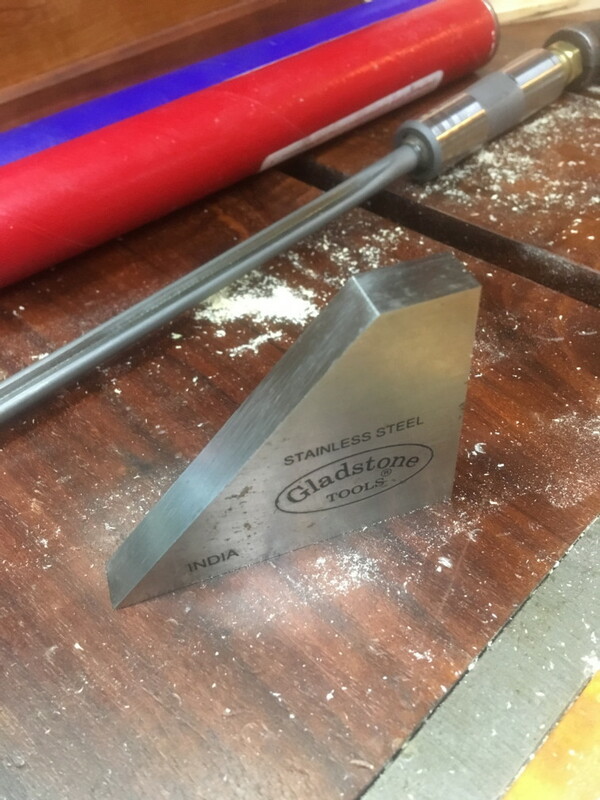 This one has an added advantage in a scale at one end with the measurements clearly identified in 32nds of an inch up to an inch and a half. 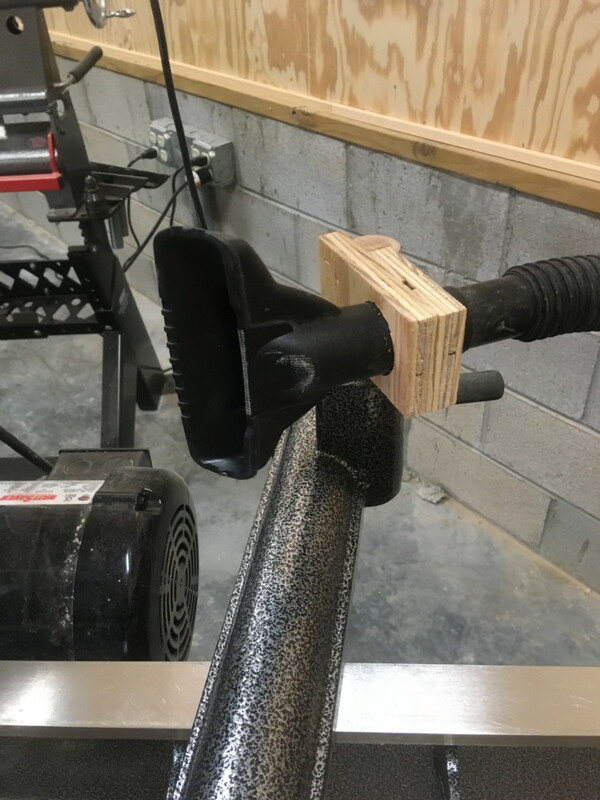 This is a perfect tool for box makers who are often required to change table saw angle settings from 45-90 degrees and back. The scale is perfect for setting blade heights. If I had known it was in my truck, I would have used it several times in the last week. I am scratching my head with regard to how and from whom I acquired it. In the background on my bench is more recent tool acquisition. Have you ever needed to drill a long straight hole in wood or metal? The gun drill is the tool of choice. I was introduced to the gun drill by Larry Copas as he used one to drill into a hollow form on the lathe. For metal, a stream of lubricating oil is delivered under pressure to the tip to prevent overheating. 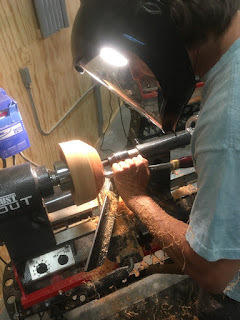 On the wood lathe, compressed air provides the needed cooling, and Larry was kind enough to adapt this one, bought on eBay so that it can be hooked up to compressed air. The World Health Organization is about to name "gaming disorder" as a mental health condition. Computer games are engineered to be addictive. Creating objects of useful beauty can also be addictive but it allows you or your child to make concrete contributions to family and community. Which do you think is the better idea? We learn so very much from each other. Make, fix, create and extend the circle so that others learn likewise. Yesterday I relaxed some following my 5 day class at ESSA making Viking style chests. The student made chests, as you can see are just as lovely as the one I made in preparation for the class. The finish applied is boiled linseed oil, a finish used by the Vikings made from flax seed oil. Flax is the only natural plant fiber that is grown in Western Europe. It is used to make linen cloth. I have turned my attention toward preparation for my next classes. During the week, June 25-29 I will teach a class at ESSA in box making. On June 30 to July 1, I will teach a parent child class in making box guitars. You may sign up at ESSA-Art.org. This is father's day. It is a national holiday to celebrate the father and his role in caring for children. You cannot be a real father without kids. While we celebrate this day, by saying "happy" to each other, children are being taken from their mothers. Fathers are being incarcerated, expelled from our country and kept away from their children. We think of ourselves as being humane and our nation as being good, but our government under it's current leadership is not. We are facing failure of our own national morality. One political party that generally proclaims its own moral and ethical superiority appears happy with that. Yesterday we completed the class on making Viking style chests at the Eureka Springs School of the Arts. The hardware the students made under the instruction of Bob Patrick worked well. The chests are lovely, and all the students were pleased with their work and with what they had learned. At ESSA I keep making new friends, and this week, having blacksmiths, woodturners and woodworkers sharing the same studio complex, the opportunities were exponential, and my students were making friends with each other. Now I begin planning and preparation for my next two classes. Make, fix, create, and adjust education so that other learn likewise. A friend refined my lathe dust collector to use larger 3 in. PVC pipe, as shown. He says it is based on my invention, but it shows his ingenuity as well. I see it as an improvement as it can use a much larger and more powerful dust collector. You can see that much happens at the Eureka Springs School of the Arts, including classes. 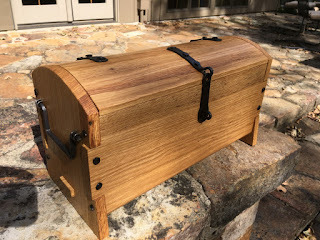 My shared class with Bob Patrick will come together today to finish our Viking style chests. Forged iron nails will be used to secure the corners of the chests, and be clinched to hold the hardware in place. Yesterday we had a well attended studio stroll at the Eureka Springs School of the Arts. It was the one year anniversary of the first classes in the woodshop, and we had demonstrations in pastels, blacksmithing, woodturning and box making. Many family members came to see what their loved ones had learned. I got an email this morning from Fine Woodworking inviting me to learn how to hand plane from a master. That's all well and good. We love work and could watch it all day. But where will you take the next step and learn through your own hands? ESSA is more interesting than youtube. Make, fix, create and enlist others in assisting all to learn likewise. 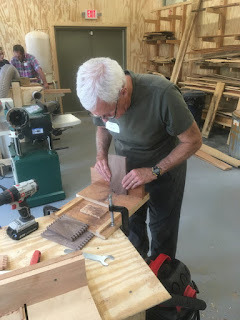 Yesterday Bob Patrick and I switched students, with mine from earlier in the week moving to making hardware in the metals studio, and the ones who had made hardware the first two days moving to the wood shop. By Friday we will be ready to add the hardware and install the nails that hold the Viking chests together as a finished and lasting pieces. So far, my students seem very pleased with their work and with what they have learned. Today we have studio stroll from 4-5 PM and you are welcome to attend. There will be demonstrations to enjoy in blacksmithing, wood turning, and in the wood shop. 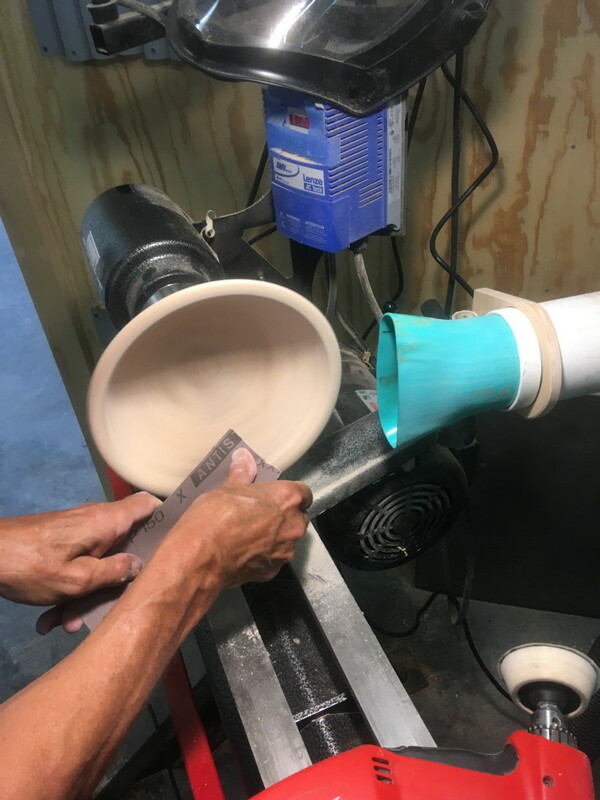 This is a big week at the Eureka Springs School of the Arts, as this is the first time all three studios in our wood and metals complex have been busy at the same time. 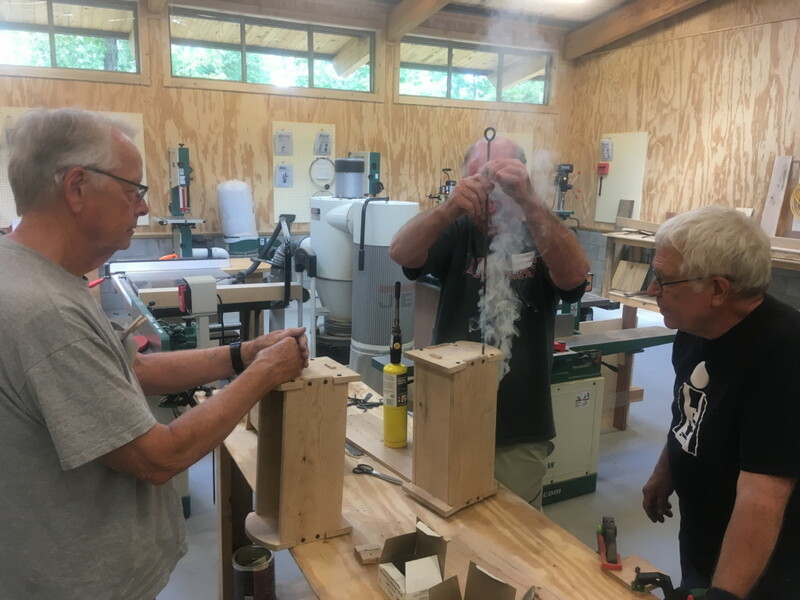 We have Bob Patrick's class forging hardware for the Viking style chests we're making in the wood shop, while we have Les Brandt's class on woodturning taking place in the turning studio. This has been a goal of mine: to see a sustained maximum utilization of our studio spaces. While we are a long ways from full occupancy on a weekly basis, this week is a step in the right direction. Please come for studio stroll on Thursday to see the classes in action. Keeping the studios fully utilized requires student participation. My students ask, "why don't more folks know about this school?" Visit and tell your friends, or bring some with you when you come. If you've been one of the many whose lives have been transformed by a class at ESSA, tell others about it. This day in wood shop, my students completed the wooden parts for their Viking chests and will begin work with Bob Patrick to make the hardware tomorrow morning. Tomorrow morning Bob Patrick's blacksmithing students who've finished their forging, will join me in the wood shop. On Friday we will meet as a full group to finish our Viking chests. I hope Bob Patrick and I can do this same exercise again in a year or two. Make, fix, create, and join me in encouraging others to learn likewise. Yesterday we got off to a good start on making Viking style chests at ESSA. 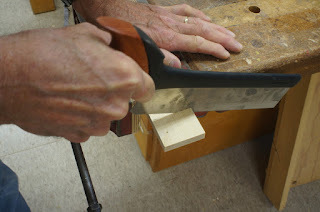 I had intended that we work primarily with hand tools, but it quickly became apparent that developing those skills in a such a short time might have been unreasonable for us. The purpose of modern tools is of course to make things easier, faster and more accurate, and to achieve a level of workmanship less dependent on years of personal development. Most of the mistakes yesterday were mine, as a result of faulty set-up. All new things require learning, and learning requires error. One thing that went particularly well was making coopered lids. My students all got their hands into the process as a collaborative venture, as shown in the photo. I am grateful to have this opportunity to teach. 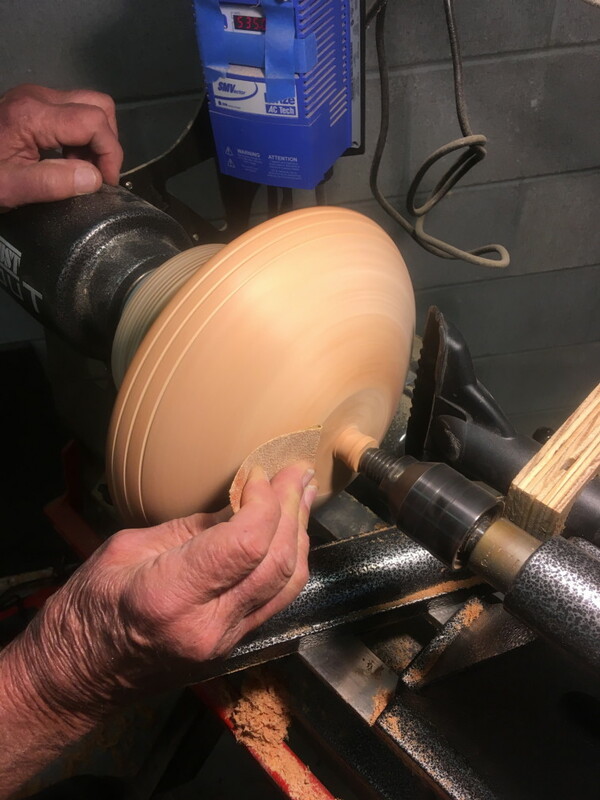 This week the American Association of Woodturners is meeting in Portland, Oregon. I heard from one of the editors of their magazine that they want to run the tip I posted here yesterday on the blog, concerning a dust collection device you can make yourself. He and I will communicate on the details later, after the big annual woodturning conference is over. I'm pleased that I am able to offer something useful to others. My good friends Ed and Buz are in Portland and I know they will enjoy it. Today I start my class making a Viking style chest in collaboration with master blacksmith, Bob Patrick. Bob and I are a lot alike in that we've been doing things long enough to have whittled away most of what could be considered distracting and non-essential to the process. We will have a total of 9 students for the 5 days, and I've been looking forward to this for weeks. The box in the photo is made to hold library pockets, which are in turn made to hold 3 x 5 in. cards. Teachers at the Clear Spring School want this to be the first project when we start back to school at the end of summer. I made it as a demonstration on how to make a simple, useful, unlidded box. The library card pockets are a perfect fit. Make, fix, create, and adjust education so that others learn lifewise. I have simple invention that I made for the lathe, that allows a standard shop vac to be used to remove sanding dust. There are two critical factors in dust collection. One is the volume of air passing through the space in which the dust s being generated. The other is the proximity and efficiency of the collection device. You can have a very large machine pulling huge amounts of air and still miss the pickup of airborne particles that create havoc and health risk in the shop. You can test this with your home vacuum cleaner by trying to pick something up that is inches away. Even a much more powerful vacuum will have the same difficulties. I made these simple vacuum devices for the lathes at the Eureka Springs School of the Arts. Taking the place of the tool rest during sanding it can be set close to the source and thus be more effective than large dust collectors. It mounts to the lathe with a simple cylinder turned on one end to fit the post hole for the tool rest. I used a circle cutter to cut the hole for the vacuum tool to fit, attached it to the post with glue and staples and the vacuum tool simply fits in one side and the vacuum hose into the tool from the other. The vacuum cleaner tool can be turned in the holder to the angle you desire. The post to which it is attached and mounted in the banjo, can be raised, lowered or turned for maximum effect, thus tuned in to get closer to the source of dust than a standard dust collector. I had considered a much more complex and powerful dust collection system for the lathe room. Perhaps there is merit in a simpler approach, and the simplicity of this device may be useful to other woodturners. I have submitted this as a tip to American Woodturner Magazine. As with many of my ideas, they seem so simple to me that it seems likely that they are no big deal at all, and have likely been discovered and invented by others before me. I have learned, however, that is not often the case. And this, like most of the things I invent, you can make yourself. 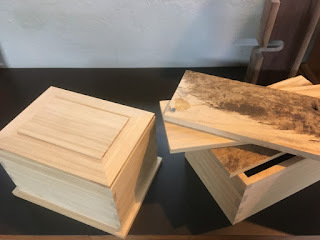 Yesterday I demonstrated the making of a miter box on camera for use in my book, "Wisdom of the hands, a guide to teachers of the manual arts." I also demonstrated that you can make perfectly square cuts just using a saw and square. You mark with the square and pencil, then cut using your saw and your careful attention. It requires practice. It requires attention to posture and grip of the hand on saw and you get better at it. This brings me to the question, is it the teacher's job to make things easy for his students, or difficult, or simply to assist and guide in the dance between the two? If work is hard we learn more, and develop more and remember more. Learning to saw takes place in the body and in the mind and in the powers of attention. Educational Sloyd suggests that students move from the easy to the more difficult. But make things too easy... to the point that student attention is not required, and interest quickly wanes and sense of accomplishment falters. Early manual arts educators were concerned that work not become "overly mechanical" which is what it becomes when provisions are made for it to be thoughtlessly done. 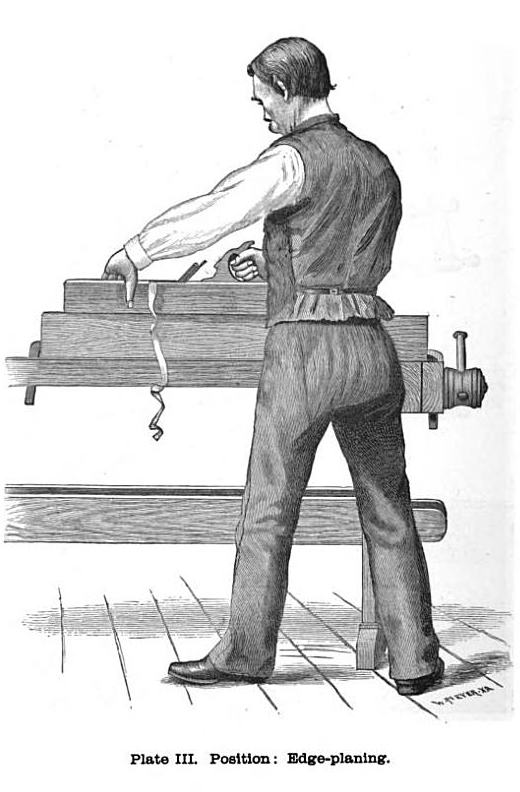 Woodworking philosopher David Pye had noted the difference between craftsmanship of certainty in which the jigs and fixtures were set up to avoid error (and everything always comes out the same), and craftsmanship of risk in which the craftsman is reliant upon his own intellect, her own attention and their own skill. 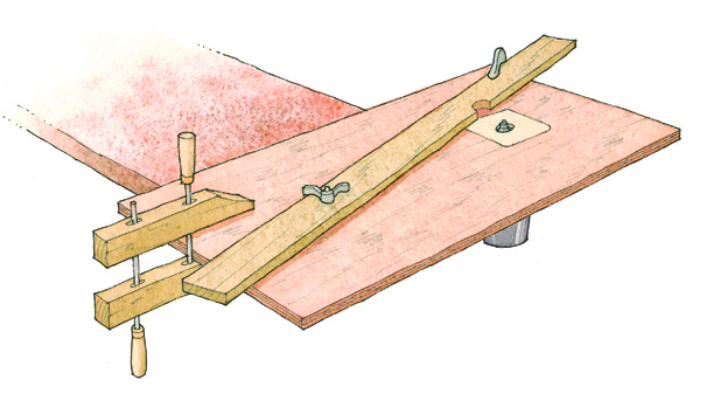 The purpose of a miter box is to hold the material and saw square to each other so that the cut is square. Attention, practice and skill can do the same thing with greater rewards in learning and satisfaction. The teachers job is in part, to know who's ready for what and to encourage the steps in growth that are most appropriate to the child at the time. I continue and will continue, to be concerned about the use of disposable plastic. https://www.cnn.com/2018/06/07/world/world-oceans-day-live-blog/index.html In essence, all plastic is disposable and everything you buy in the big box store is destined for disposal. This is not true, necessarily, of the things we make from wood or from iron. The night before last I demonstrated (for a group of women) the use of my wonderful beer bottle opener I made in blacksmithing class. I also showed photos of the massive garden claw that I made. My original intent was to make that as a gift for my wife. I realized it was larger than what she would want, so using my better judgement I made no pretense of it being a gift for our anniversary. Good thing. It frightened her. But it made a good story. The others in my blacksmithing class thought it was so romantic that I was making a garden tool for Jean. It turned out to be more than that. It's called "evidence of learning." Today is the opening celebration of the Eureka Springs Community Center. It's a day Jean has been working toward for years. 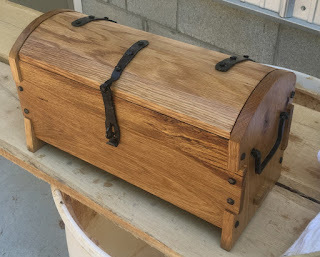 Today, also, I'll begin preparing the ESSA woodshop for my week-long class making a viking chest. Sign up if you are able. Make, fix, create and accept that we all learn best likewise. Yesterday at a staff meeting at the Clear Spring School, we built a Da Vinci bridge using half round dowels and 3/4 in. sticks. It is an interesting exercise in engineering. 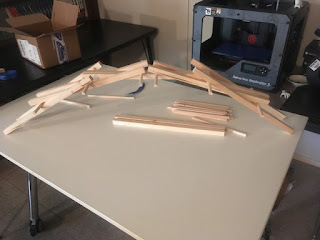 These bridges are popular as an exercise for kids interested in building things. If you have a wood shop, it takes only a few minutes to prepare a kit. This week on Passion Play Road in Eureka Springs, an amazing thing is taking place. 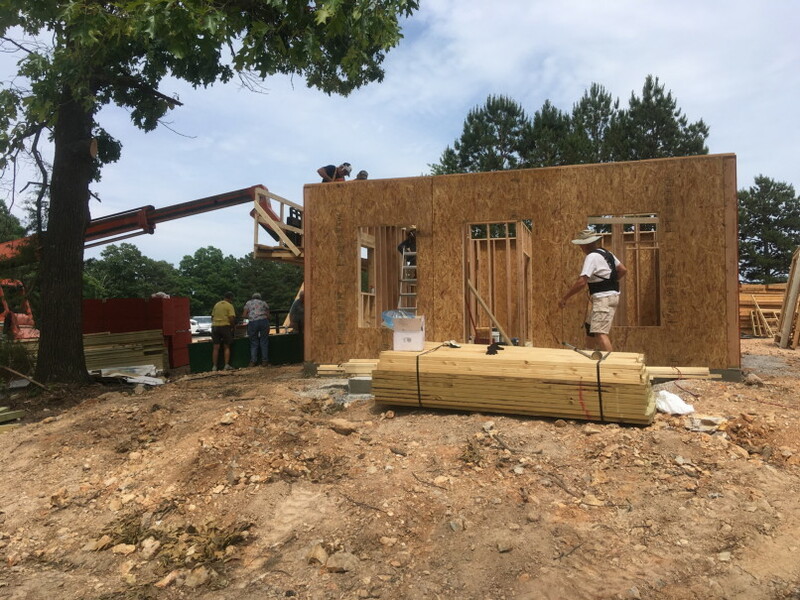 Volunteers from all over the US are creating a community of low income homes that are going up at a rapid pace. It shows in part that folks really want to be a part of something larger than themselves. They (and we) seek ways through which to make a lasting contribution to the lives of others. It is human nature to do so. Drive by or stop and watch. Take tools and you can help. Last week I ordered a couple pounds of fancy square cut nails from Tremont Cut Nail Co. Those nails come from a machine made in the 19th century. This week I'm at work preparing for the class (June 11-15) that Bob Patrick and I share, making a Viking style chest. The chest is simply an excuse to engage in the making of your own hardware, but you will create an heirloom, and there are still openings in the class. It is all about learning. What you make will be ample evidence of that. Enroll if you are a wood worker hoping to broaden your horizons into hand forged iron. Enroll if you are an experienced blacksmith and want to expand into wooden furniture and cabinetry. Both groups are welcome. In fact, you can have experience in neither and thus learn a great deal about both. The chest itself will offer the opportunity to use both hand and power tools. Students will be divided in two groups, one with Bob in the blacksmithing studio and one with me in wood. Bob and I will trade students mid week. and finish as a whole group on Friday. Even though I bought ready made square cut decorative nails for the project, Bob will demonstrate making nails and you are welcome to try that, too. Who knows, you might get good at it and lay claim to an even deeper level of accomplishment. This is not a huge chest, so you need not be wondering too hard where you will put your finished work. The prototype measures 7 in. x 15 in. x 9 in. high. In case you need a different size, it can be made slightly larger or smaller without a change in the hardware you will make yourself. Make, fix, and create. Assist others in doing likewise. In blacksmithing, I wanted to try my hand at making a garden tool. This would be the kind of thing in an earlier time one might have asked their local village blacksmith to make. 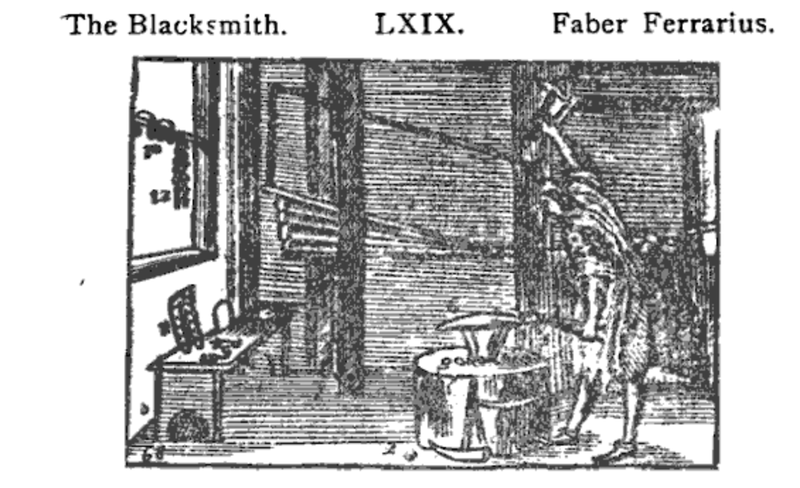 A person might walk into the blacksmith's shop and make a sketch of the size and shape of the thing to be made and return in the afternoon to pick it up. If it wasn't quite right, the blacksmith could put it back in the fire and make adjustments to a tool that would fit your hand and last your whole life. Yesterday I added a handle that cracked as I was hammering it in place. The copper ferrule I had made held it tight. Even with the flawed handle (which I could replace) it is ready to work. In any case, the tool is frightfully larger than necessary, which reminds me of an excellent paper by Rudolph J. Drillis called "Folk Norms and Biomechanics." It can be found here: http://journals.sagepub.com/doi/abs/10.1177/001872086300500502 At one time, tools were made to fit the hand and the body of the user. Now tools are made to fit the shelves of the big box store, they eye of the consumer and the economies of production. Drillis, in "Folk Norms and Biomechanics" explored the relationship between the tool and the body and the customizing to fit. To make the monster claw, I took two pieces of 3/8 in. bar stock and drew out tapers both ends. Sound easy? Perhaps it is if you practice first. I bent the ends while held red hot in the vise, and cut the side tines to length. Back in the fire, I again heated the parts red hot and malleable. Returning to the vise with the red hot stock, I bent them to align with the central tine. All this was under the guidance of master teacher Bert Jones. Bert helped me then by arc welding the parts together. After grinding to make flush, I returned the whole thing to the forge to bring the steel to an even tone. Have I made a useful tool? Perhaps for digging rocks. 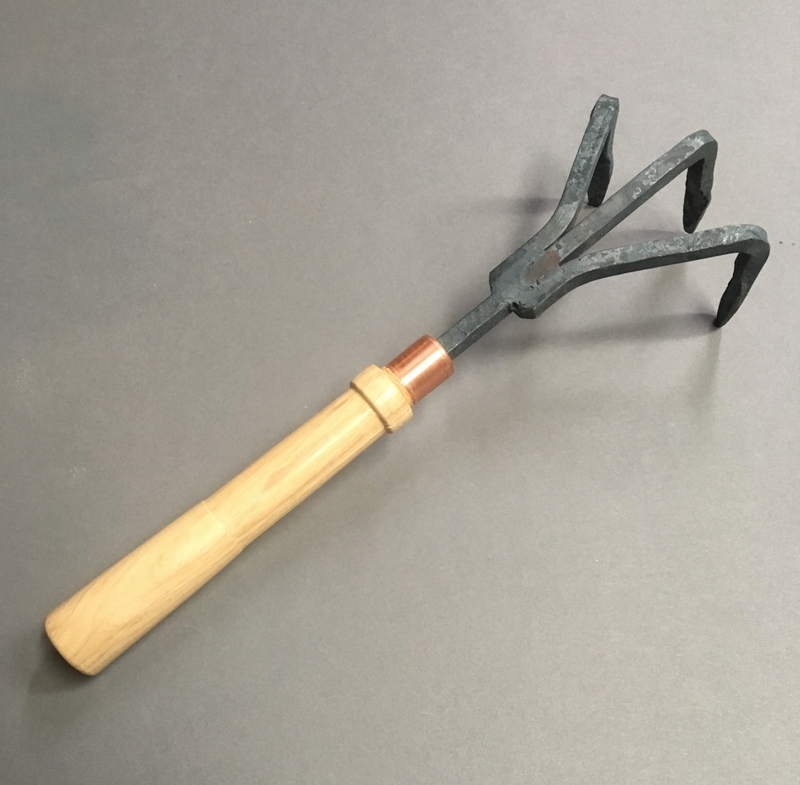 It is robust and not the gentle tool for gardening that I had in mind in the first place. But is it evidence of learning? I'll say yes on that. Make, fix, create and learn to help others learn likewise. Yesterday I took a holiday at the forge. Putting other things aside, I pounded hot steel in the ESSA metals studio. It is fun and engaging. 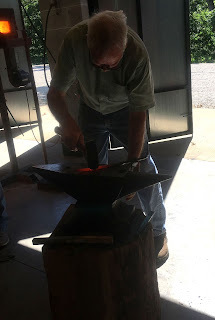 Using tongs to pull a hot iron bar from the forge, carrying it to the anvil and whacking it into a new shape with a hammer takes care and concentration. My teacher Bert Jones had gotten his start in black smithing at ESSA. He is great at showing how, and great also at building confidence. He was taught by master blacksmith Bob Patrick and so the circles widen and new folks are brought into the fold. I made two projects, one simple, one more complex. I hope others will have the confidence to try. I expanded my comfort zone. Walking around the studio with tongs and hot iron in hand was new and exciting. At one time, every small town in America would have a black smith available to fix things. Now we throw things away. The things we buy are often cheaply made and not repairable. And so we are building mountains of discarded junk and filling the oceans with plastic crap when we could instead be developing skill, developing problem solving intelligence and building character. No one is bored when they have the opportunity to do real things of value to their communities. Compare that to conventional schooling. I had a brief blacksmithing lesson at ESSA yesterday morning and today I take the hammer in hand and beat hot steel. 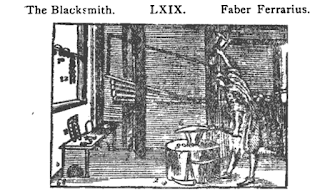 The image is of a blacksmith at work from Comenius' book Orbis Pictus, in which he developed instruction using illustrations. The book is a marvel from the 17th century, that can be found on Google Play. Search for Comenius Orbis Pictus and download it for free. I have been attracted to the ideals of the village blacksmith, the village carpenter, the village potter, the village weaver, and the village whatever, as a complete village would have all of the above and many more, each one fulfilling an important role in village life. These ideals represent a time in which each assisted others in the construction of community. 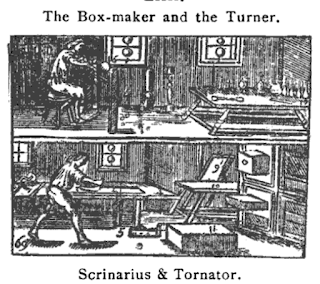 Orbis Pictus portrays many traditional craftsmen at work. Comenius offered the following counsel to the educators of his time. "The ground of this business is, that sensual (sensuous) objects be rightly presented to the senses for fear that they not be received. I say, and say it again aloud, that this is the foundation of all the rest; because we can neither act nor speak wisely, unless we first rightly understand all the things which are to be done and whereof we have to speak. Now there is nothing in the understanding which was not before in the senses. And therefore to exercise the senses well about the right perceiving of the differences of things will be to lay the grounds for wisdom and all wise discourse, and all discreet actions in one's course of life, which, because it is commonly neglected in schools, and the things that are to be learned are offered to scholars without their being understood or being rightly presented to the senses, it cometh to pass that the work of teaching and learning goeth heavily onward and offereth little benefit." Comenius was considered the father of modern education, but even in this day, schools attempt to teach things that they fail to present to the full range of senses. By failing to use the senses in education, policy makers create an atmosphere in which even those things that are veritably true are not to be trusted. As a teen and through college, my father owned a small hardware store in Valley, Nebraska. I would work there on weekends and during the week in summer months. We had a daily stream of tradesmen looking for things they needed for their work. One of my favorites ran a car wrecking business in Kings Lake, Nebraska and would come in smelling of motor oil and covered with grease, but with a smile I can remember even to this day. Folks from their fields of employment were not embarrassed by coming to town appearing as they did. I learned from them that working for a living and showing your work on what you wear is a mark of having been of service to your fellow man. Some have prejudices that will not allow them to stretch far in their acceptance of others. But man is made noble by being of service to others, even when he gets dirty in the process. The soil on hands and clothing that comes from an honest day's toil should be regarded with particular favor and wisdom gained by those who've done real things should be considered. Make, fix, and create.... Plan in schooling for students to do real things. In order to show parents and teachers how to make models for them to use to instruct kids, I'm making some of the toys we've made over the years. 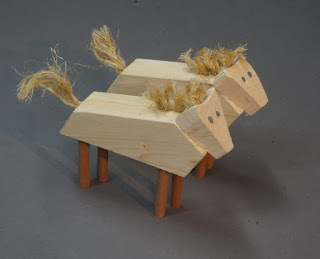 This pair of horses is to pull a wagon on a fictional adventure on the Oregon Trail. In wood shop we made horses, wagons and scale models of the necessary contents for the wagons. The students wrote stories about their journey with families they made up. It was written up in American Woodworker magazine a few years back as an example of a school woodworking program that works. Making models is necessary as it is very difficult for kids to make what they cannot see. 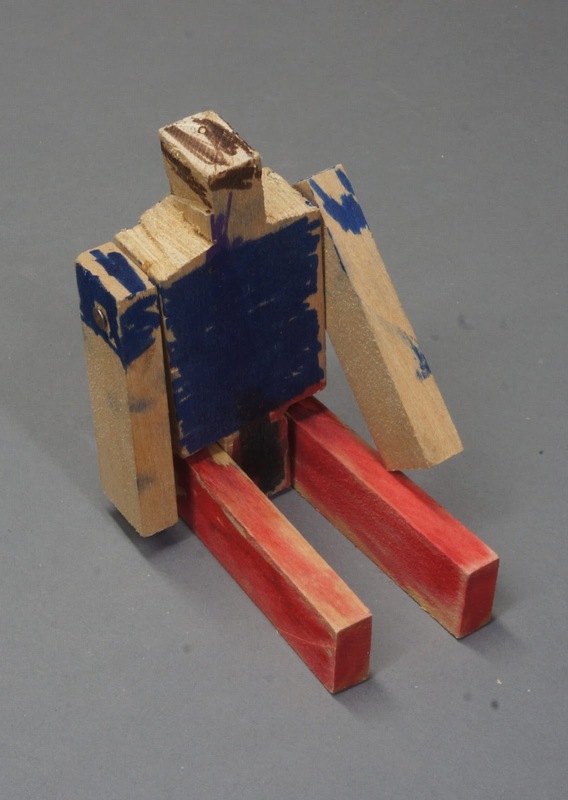 Making models is also necessary for the teacher to gain an understanding of a project's appropriateness for his students with regard to their strength, their experience, their interests, and their capabilities. Making models first allows the teacher to anticipate where the children will have difficulties with the project and make decisions with regard to what tools will work best and which tools will be needed. The model is a necessary step in the planning. Not all shop time requires models. Sometimes, after having had some experience and developing some skill, the kids have ideas of their own. This morning the woodcarving club is meeting at ESSA and a beginning blacksmithing class will be underway. Come see. I spent part of the day yesterday meeting at ESSA with the program committee and the building and grounds committee. We will be growing the school in the coming years by enriching our programs, making them more responsive to student needs and by building new facilities as we are able. The character in the photo is a previously unnamed superhero puppet that survived play with various school children on campus throughout the second semester of school. The last I saw of him before he was returned to the wood shop, he was being launched at high speed down the slide and used as target practice for slingshots. He is no worse for the wear from such abuse. When things are made of wood, they can last, and if not, they can be fixed, and when their useful life is over, they can be composted or provide warmth in the fire. This guy will serve now as an example of student work in the book I'm working on. He is a patriot. You can tell by the red, blue and natural wood colors. I hereby name him "Captain America" and you can tell by his small head, that his body is strong. A reader informed me that even in Vermont, wood working programs are still falling under the policy maker's axe. I have this fantasy... that we learn to devote our time to making things that last, that are worth caring for, and that then allow us to withdraw from participation in the consumer culture that's killing us and the planet. On Sunday we were invited to dinner and ate from the ceramic plates the hostess had made. Can we have more of that, PLEASE? On Sunday I plan to take a blacksmithing class at ESSA, and use my time there to harden blades for carving knives so they can be re-handled and made more useful than when I made them in the first place. Each thing we learn to do for ourselves cuts one of the strings that binds us as mindless consumers to a wheel of planetary destruction. I will be writing today and fitting drawers to small jewelry chests to maintain balance during the process. When the manual arts were first introduced to schools, many teachers argued that there was no time in the school day for such frivolity. Manual arts proponents argued successfully, that learning to making real things, actually made the time spent in academic work more effective, and raised the students' interests overall. The manual arts advocates were proven right. Then the policy maker's efforts to cheap out on our children's educations pushed manual training aside. We can fix that. Make, fix, create, and adjust education so that we all learn likewise.